Generally speaking new hives must be allowed to build up the strength of the colony and rarely produce more honey than they need for their survival in the first season. Flowering plants yield nectar in spring which runs through until July and between September through to the early frosts. Honey can be collected in May and early September as a rough guide and established hives can produce between 50 to 90 pounds of honey. There are two ways to extract honey. Letting it drip from the uncapped comb into a pan or crush the comb and squeeze it through a cheesecloth. Windless sunny days are the best time to harvest as bees tend to be at their calmest. Driving the bees away from the comb is achieved by blowing smoke through the hive opening to quiet the bees. Care needs to be exercised here as too much smoke can injure the bees. After a couple of minutes the outer cover can be removed and more smoke blown through before finally using a hive tool to remove the frames which actually contain the honey comb. Care needs to be taken not to crush any bees in this process as crushed bees release a scent that stimulates other bees to attack, not a good idea I can tell you. A comb is ready to harvest when it is 80% sealed over. Uncapping the combs is best done in a bee proof area. The comb tops are sliced off with a sharp knife warmed in hot water. The combs are then placed into a centrifugal extractor where the handle is turned at a moderate speed in order to avoid damage to the wax component of the comb. The emptied combs are returned to the hive for the bees to clean and use again. It is possible to recycle combs many times, sometimes over 15 seasons. Some bee keepers feed bees sugar water and others prefer to leave a frame of unharvested honey in the hive so that the bees have a store of food to tide them over the winter. Extracted honey is strained through a cheesecloth to remove impurities and wax. It’s then left to stand for several days to release air bubbles. After this it is heated to 150f before being bottled. Sometimes the honey can crystalize, a natural process but this can corrected by stirring during the heating process. Behind the scenes – Take a peek into the hives. In the video above you will see the hives being inspected by our bee-keeper Nigel. The white areas of the frames are where the honey has been capped off and stored and the yellow/orange areas in the centre are the new bee larvae. On average the queen lives for around 3 years though they are often replaced before the end of their life cycle with new queens. During the winter months the bees are fed on sugar water for as long as they will take it. This approach ensures the health of the hive when there is little natural food about in the wild. Generally bees will travel around 3 miles from the hive, each in a specific direction pre-planned before they leave the hive. It can take around 15 such trips, visiting 50 odd flowers to produce one ounce of honey, flying at between 12 to 15 mph. As bees return from foraging trips they signal to bees in the hive the direction and distance of pollen rich flowers. In order to stop the bees swarming too far from the hives the queens have a very small section of their wings clipped. To aid identification a coloured dot of specialised paint is applied to the queens thorax, this will be a different colour for each year of it’s life cycle and also allows the bee-keeper to keep track of it’s age. 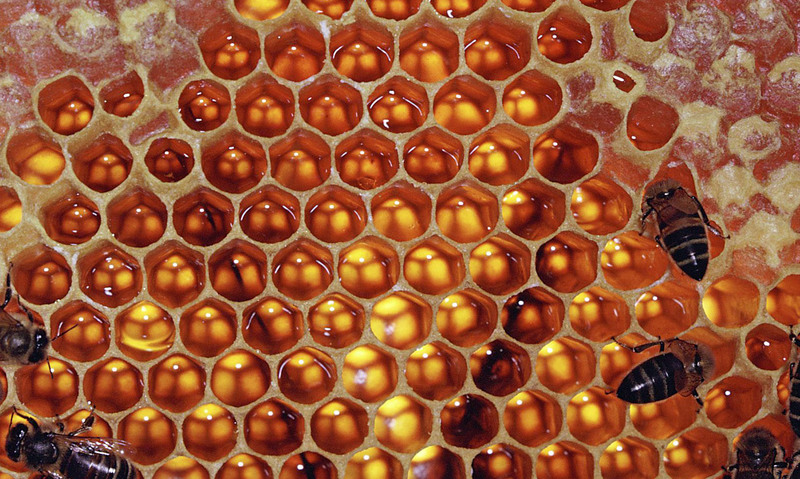 The queen will lay around 2000 eggs per day and a worker bee will live around 30 days. Essentially they work them selves to death during the peak season but can live twice as long during the winter. This year we will not take any honey from the hives. Being the first season we want them to build up their numbers and health. For my part, this is the first time I have had the chance to film bee hives and get close up to see what goes on behind the scenes so to speak. It has certainly been a learning exercise and a very interesting one at that. Bees are truly amazing insects. Discover more about bees via Did you know?